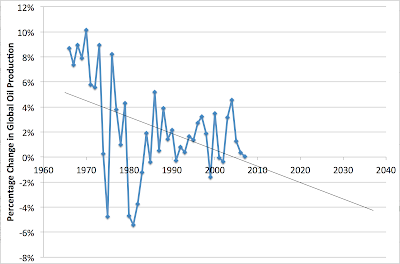 Early Warning: Should The Last Few Years Have Updated Your Idea of Peak Oil? Should The Last Few Years Have Updated Your Idea of Peak Oil? Oil production will be reduced approximately by half in the next 20 years, even with the exploitation of oil sands or shale oil. For oil production to halve over the next twenty years, it would have to decline on average by 3.5%/yr throughout that time (possibly some years by more, some years by less). Above I have posted the average annual change in oil production 1965-2012 (with data from BP except for 2012 from EIA). 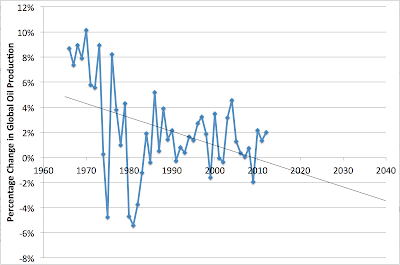 I have also added a linear trend line out to 2040. Obviously, this is a rather rough time series and the linear fit is not particularly strong and the extrapolation not particularly stable. But it's not clear that anything else will work much better - global oil production is a very complex process that we understand poorly. In that situation, we are probably best sticking to very simple models and acknowledging their severe limitations. 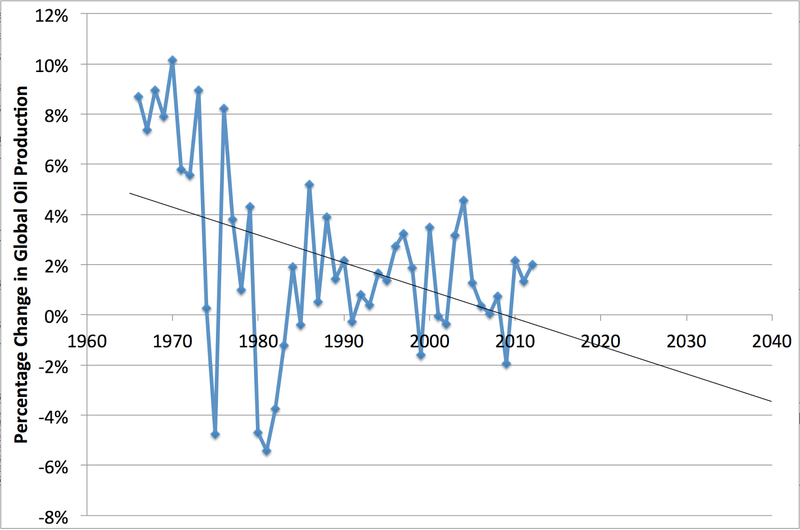 At any rate, the straight line implies that peak oil (in the sense of "average growth is zero") was in about 2009. The straight line also implies that we would not reach average growth being -3.5% until almost 2040. So Professor Meadows is asserting unequivocally that this line is going to make an abrupt turn downwards in the next decade or two. Possible, but it's a strong claim that requires strong evidence, and the interview certainly doesn't lay out the basis for his views, or his certainty in them. You can see that on that basis, peak oil was projected to be in 2004. So five years of additional data have moved the peak later by five years. That should give anyone with an open mind very strong pause indeed about asserting that they have a very clear idea of when peak oil is any more. And the date at which oil production would be -3.5% has gone from about 2030 to the late 2030s. Five years' data have moved that estimate more than five years. I think Professor Meadows is expressing an inappropriate level of certainty in an inappropriately negative scenario, given the available data. I think all that we can say with any confidence at this point is that it seems in the last decade to have become much more difficult to raise oil production by large percentages than it used to be, even in the presence of sustained high oil prices. Presumably this reflects a move closer to peak oil - I think it's reasonable to suggest that we are on a bumpy plateau around the oil peak. But not more than that. pro-"we'll run out" is the apparent red-queen behavior of tight oil production (i.e., you have to drill like crazy to keep production up because per-well production drops off so rapidly). anti="we'll run out" is that I bet there's much more tight oil than just North Dakota -- the red queen can run in many other places. What's completely unknown to me is what sort of crazy nonsense we'll do to get the oil out that current methods leave behind. At a certain oil price, many ships might convert to sail; at a higher price, many cars might convert to electric (or to bicycles, or to motorcycles, or carpools, etc). At some point it will become uneconomical for air travel (or rather, air travel will become mostly uneconomical). Stuart, Gail Tverberg recent piece covering the oil exporting nation's internal growth vs. ability to export surplus oil details a reality not taken into account by simple production analysis. See: http://ourfiniteworld.com/2013/04/05/how-oil-exporters-reach-financial-collapse/ ... the comments section continues the discussion well, too. 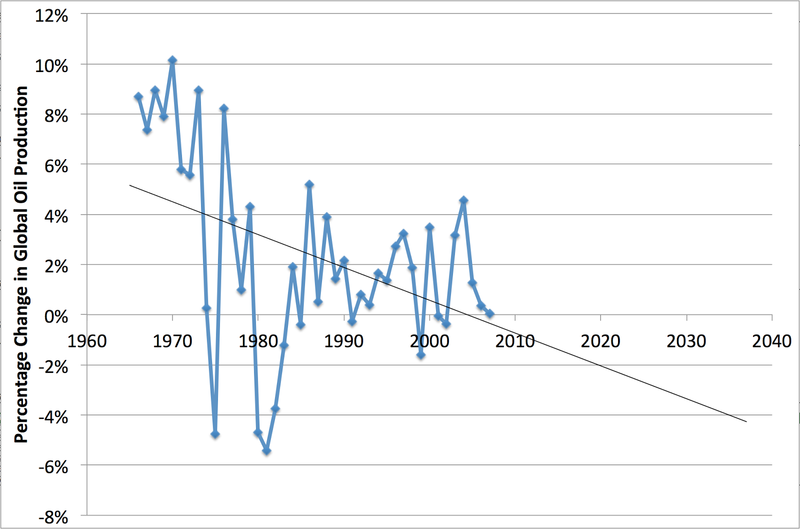 The "exportland" model will cause steeper apparent declines than simple production declines. Mr Sunshine - it's certainly true that the developing world in general will continue to grow it's usage, including oil exporters though they are not the most important part of the trend. Therefore, as I've discussed elsewhere at length, developed countries have likely seen peak consumption already. But that's not what Prof Meadows is saying. How many areas in the world are similar to the Bakken Shale as far as having ample places to drill for tight oil? Wasn't there something about the areas around the Caspian sea, back when that was supposed to be the next big thing? Or is this pretty much a US geology feature? There should be places in Canada too surely? Stuart, I read the interview (missed the link first go past, thanks to my advancing age and color blindness) and he says a lot, with the single line you blog about here being the only line in the interview about oil. The interview is actually a pretty good overall summary of his positions since 1970 - the growth as cancer analogy, with societies attempt to treat the symptoms, is sound. Having considered the overall piece, I suspect Meadows "Rule of 72" prediction of a 3.5% decline is based on old, large conventional field declines, where the majority of global oil comes from, as measured and reported over the past few years. I recall an IEA figure that was higher than this a couple of years back, over 5% p/a, given as the average production decline in production at the 500 largest global fields then, but would have to refer to my class materials to find the citation. Meadows didn't refer to any reason behind his "half" projection, so an assumption that it will come from production decline only is a stretch - Meadows says "There are too many “ifs” for the future: If people are smarter, if there is no war, if we make a technological advancement. We are now already at the point where we cannot cope with our problems, how we should do it in 50 years, when they are bigger?" I think it would be helpful in these "too peaked or not too peaked" discussions to draw separate charts, one for conventional crude and lease condensate, and one for everything else (natural gas plant liquids, tar, refinery gains, bio, whatever). On the former, by EIA numbers, we've gone from 74.0Mbpd in April 2005, up to a peak of 76.0Mbpd in April 2012, and it's been downhill from there. Also, the monthly YoY production change graph dips below zero much more than the charts above. Looking at that, one has to ask, is it really the case that suddenly producers are proportionally less interested in pumping crude than they used to be, with prices now reliably above $100/barrel? Why don't you fit to the derivative of a Hubbert curve for a time contant and maximum oil production? It might be informative and it is more of a model than a linear regression. I think that a more useful measure of the peak in energy production would be to examine the EROEI of our energy sources over time. Our civilization was not built on the gross energy represented by a barrel of oil, but the net energy that is inherent in the process. If the net energy is too low, there simply is not enough surplus to perform useful work that is of benefit to productive wealth creation. There are analysts who put the floor at roughly 8:1, ie. one barrel of oil equivalent in to eight barrels of oil equivalent out. Below 8:1 there simply is not enough net energy present to drive the wheels of a truck, once refining, transport etc. are taken into account. Shale oil, tar sands and deep water extraction are all marginal activities, where to get the same net energy as a barrel of light sweet crude will take 8-10 barrels of the lower quality products. In short, we may be able to create graphs that show that we are on the bumpy plateau if we only look at barrels of oil as the measure, but once forced to take into account net energy as the true measure we must acknowledge that we are well on our way down. Peak Oil is not about the end of oil. It is about the end of oil of a high enough net energy to continue to maintain the civilization that we have built that requires ever increasing quantities of high EROEI energy. Good Afternoon Stuart, I am reading your blog with delight. Mark Lewis, Head of energy research, Deutsche Bank is saying: "We believe there will be a rapid erosion in OPEC spare capacity over time. domestic consumers". In addition, during ASPO USA Meeting taking place in Austin, Texas on Nov. 30, 2012, he stated that there is actually no Peak Oil issue, but more a liquid fuel serious issue. I listed the different assumptions how fast is existing production declining? • 5.5-6.5% Höök, Hirsch & Aleklett. Charles Hall is also talking on bio physical economics, saying that we are facing these limits right now. And it seems to me that reasonable evaluation of URR can be done (although from a few persons for sure). In above "less than half" has to be replaced by "more than half"
Peak oil may have come and gone, or not. I'm just not sure it matters. What I'm sure does matter is the net energy decline curve/price ratio. We're not looking for hydrocarbons, we're looking for positive net energy. This continues to decline, particularly as we include low-net energy product such as oil sands, or deepwater heavy sour crude. Net energy X absolute quantity = Total energy. Any way you look at it, the absolute amount of net energy in the oil that's left is far less than in what was extracted earlier. Not only is there less of it, but we're going to have to pay a lot more for what we get. This is the energy problem in a nutshell, not peak oil. The world's interdependent "just-in-time" supply chains depend on *cheap* transportation fuel. As prices for that fuel increase, more and more critical items are no longer economically viable to produce or export. When this starts impacting the energy industry itself (e.g. unavailable pipe), then the breaks are no longer gradual, but sudden, and from our perspective, permanent. Peak CHEAP oil is much more unambiguously in the past. Now the question is to what extreme oil prices will have to rise to allow for a true economic recovery and whether a recovery on those terms isn't a contradiction in its own right. Until then we are faced with "peak demand", which is a phenomenon that confirms, not refutes, peak cheap oil. What is clearly visible is sustained high energy prices while the U.S. and western Europe struggle to find mechanisms for economic growth as their economies become less oil-intensive. I don't see that story changing much for the better in my lifetime. You are fitting an awkward model ((x^2+2x)/2) to a curve that seems to include things other than petroleum (fossil liquid). I'm sceptical, but I wouldn't bet on a halving of production in 20 years either. This post is very nostalgic, lots of nice memories. Best. Even if the 4 worse data points are thrown out (as not random), then we would have a 1/6th chance of a value -2.75% or worse. In either case, it could produce an oil shock, induce hoarding, exacerbate the problem, and thereby create permanent scarcity. marketquant - I would completely agree that we remain at material risk of oil shocks. However, there's a heck of a difference between the odd annual excursion to -3% or -4% and twenty years averaging that (which would presumably would then have to include excursions to -8%, -10%, or more. If the prior large excursions were viewed as political (not random), but several new excursions were viewed as geological, then the response will likely be very different. A fairly short series of shortfalls would probably do it (in the absence of export restrictions). "Not quite there" said... Why don't you fit to the derivative of a Hubbert curve for a time contant and maximum oil production? It might be informative and it is more of a model than a linear regression. EXACTLY - you can't fit a straight line trend line to a set of data that is not linear - it is Hubbertian. I am very surprised that you should make such an elementary mistake. I really think you ought to do it all again. Hi Stuart, my definition of peak oil has always been according to the original intention as Hubbert had asserted, i.e., conventional oil. I realise too that the world has extracted or will extract more than Hubbert first thought. So, for me, EROI is important. Tar sands, deep oil etc has many dependencies that conventional oil does not. For example, could countries such as Saudi Arabia get by if their extraction costs were equivalent of tar sands. I heard Prof Meadows speak before and my recollection is that he was looking at conventional oil. Definitions are important otherwise nobody knows what anyone is really talking about. Keep up the good work, Stuart. When I first learned of peak oil, I was scared witless. Time has mellowed that view and now I just watch what happens with an open mind. Your blog feeds me posts like this one, which is level-headed, fact-based, and helps me understand WTF is going on. and then "Download the workbook" near the bottom. Dr Michael Kumhos leader of an IMF team of economists, did some scenario analysis. He points out that a 2% decline in oil supplies translate to a 1% decline in GDP. Can we even deal with a 20% decline in world GDP in 20 years resulting from only a 2% decline in world oil supplies? oil is so political and essential for business and growth that the actual truth is hidden. We have the oil companies massaging the figures by now including liquid gas and other non crude oils. The truth would cause chaos in OPEC countries, pension funds and governments who only have the carrot of growth. Since 2005 energy prices [excluding the shale gas bubble]including coal and domestic have rapidly inflated and the last 7 years has seen a doubling in price. About the same time real disposable income in the US, Europe and Japan started to fall. The 2008 credit crash had its roots in earlier losses that were hidden. If sounds a like a duck, walks like a duck- well it probably is a duck. There are many 'peak oils'. Which one? The real peak was before the 1850s, when oil well drilling began in earnest (leaving out the ancient Chinese and Japanese wells). The real issue is the returns not gained by 'using' (wasting) the oil. Because the use does not pay for itself there must be a substitute ... which is borrowing. Currently, there is too much accumulated debt, borrowing costs too high, so much so that crude customers are effectively broke. Customers find it more difficult to gain credit in order to support the cost of extracting new oil. When the credit is gone the oil stays in the ground because nobody can afford to get at it. Under such circumstances, the falloff in fuel extraction is severe. The focus on extraction or rates of extraction is misplaced. The real problem is the what is done with/to the oil after it is extracted. It is why economies are failing right now.